OKLAHOMA CITY – This summer the Sunday Twilight Concert Series, presented by Devon Energy, invites music lovers of all ages to free, family-friendly concerts at the Myriad Gardens. This Sunday, July 22 at 7:30 p.m., a variety of artists take the stage for a very special Singer/Songwriter Night! A first for the Sunday night concert series, the singer/songwriter-themed concert transforms the evening into a showcase for a variety of talented musicians. From the smooth and classic tunes of Bob Moore to the folksy, playful lyrics of Carter Sampson and genres in-between, this special night is sure to provide a little something for everyone. The concerts are free and take place from 7:30 to 9 p.m. at the Band Shell on the Great Lawn at the Myriad Botanical Gardens. Attendees are encouraged to bring blankets and chairs; however pets and glass containers are prohibited. The 32nd annual Sunday Twilight Concert Series is presented by Devon Energy with additional support from Oklahoma Arts Council, Allied Arts, National Endowment for the Arts and Magic 104.1 – KMGL. For more information please visit www.ArtsCouncilOKC.com. The Arts Council of Oklahoma City is a non-profit 501 c(3) organization dedicated to bringing the arts and the community together through free or low-cost cultural events and a variety of arts outreach activities that impact under-served populations. Each year, Arts Council events, programs and services reach nearly one million residents and visitors to the Oklahoma City community. The Arts Council of Oklahoma City receives funding from the Oklahoma Arts Council and is an Allied Arts member agency. The Arts Council of Oklahoma City is sponsored by Chesapeake Energy Corporation and Devon Energy Corporation, MidFirst Bank, The Oklahoman, Ozarka Coffee and Water Service, and Sonic – America’s Drive-in and the Kirkpatrick Family Fund. 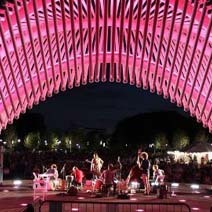 For more information, call 405-270-4848 or visit www.ArtsCouncilOKC.com. Devon, headquartered in downtown Oklahoma City, is one of the nation’s leading independent oil and natural gas producers. The company is committed to supporting communities where it operates by investing in youth and education, the arts, civic initiatives, the environment and emergency response agencies. Devon has been an annual supporter of the Arts Council of Oklahoma City for many years, supporting the Festival of the Arts, the OKC Storytelling Festival, Devon Energy Sunday Twilight Concert Series and Opening Night.